It’s been a while since since the Consular Section of HM British Embassy has had any news for you, so we thought it was about time we sent you the latest news from us here in the Consular Section. Obviously with the results of the referendum still being digested, there are lots of people out there who may have questions on some of the aspects of “what it means for us”. The FCO have created a website especially with this in mind called “Advice for British nationals travelling and living in Europe”. We understand that this website will be updated regularly, so please take a look at it periodically. We would also like to remind all of you to enter your next-of-kin or people you would like contacted in cases of emergency in your British passports. A couple of incidents that we have had to assist with recently have highlighted the need for this information to be ready at hand. For instance, you are travelling alone and you are taken seriously ill or involved in an accident, taken to hospital where you are unconscious. The hospital staff are trying to contact your next-of-kin or anyone who knows you to inform them of your situation. They may need information to help them with your condition. You may or not know that there is page in your passport set aside for this information. 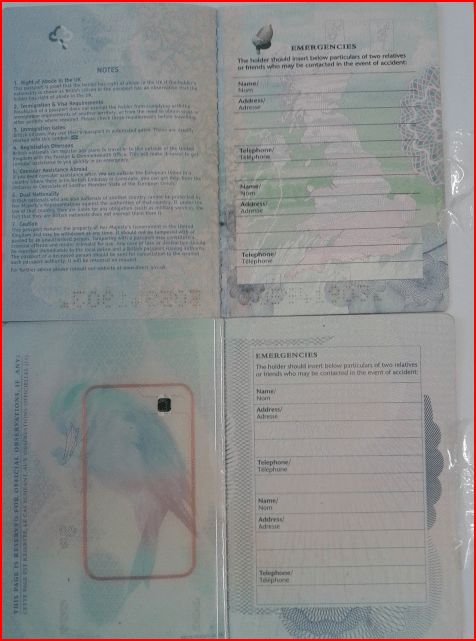 It’s usually on the back page as shown to the left for both old style and new style British passports. We would recommend that you fill in these details as, in a real emergency, it can save time otherwise lost if we have to go through a long process of trying to find out this information from other sources.